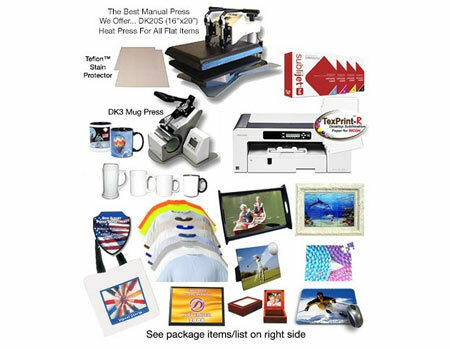 With this product combination you can print transfers to produce: Mugs, License Plates, Picture Frames, Clip Boards, Tiles, Mouse Pads, Sublimatable Shirts and Many More Products! Please see this link to view all of the products you can produce with this. This is our best manual heat press, very rugged yet easy to use. With this heat press you can print on Shirts, Mouse Pads, Ceramic Tiles, Tote Bags, Puzzles and just about any flat item up to 2" thick! Stain Protection for Your Heat Press - Premium grade 16"x20" Non-Stick Sheet & Non-Stick Pad Protector. Keeps the upper & lower heat press platens clean from hard to remove inks. Full wrap-around, handle to handle, top-to-bottom printing. Press images up to 5" high, and as close as 1⁄2" from the handle, depending on the mug size. Allows for full bleed transfers on even the most demanding mugs. Fully adjustable, accommodating 11 oz, 15 oz, 16 oz, mugs & steins.